Your sister tells you she's pregnant. She presents you with a smudgy, black, how-is-this-even-a-baby picture. "Adorable!" you croon/lie. Because those early-stage sonograms? They don't look like anything at all. But a cinematic MRI produces super detailed pictures of that fetus. And it's being employed by a researcher in the U.K. to look at twins for the first time. Marisa Taylor-Clarke is using the technique to study twin-to-twin transfusion syndrome, a disorder where the two babies' blood supplies connect, one gets more of the supply, and the other's growth is stunted. While the usual imaging method takes pictures of little slices of the body, cinematic MRIs capture the same slice over and over and pulls them together to make a pretty amazing video. 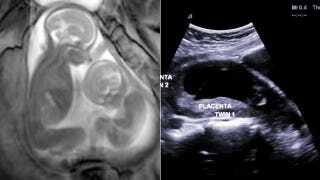 These snapshots offer an unprecedented view inside the womb. You can see the twins' tiny fists, little feet kicking, and even their itty bitty brains inside their not-yet-fully-grown heads.